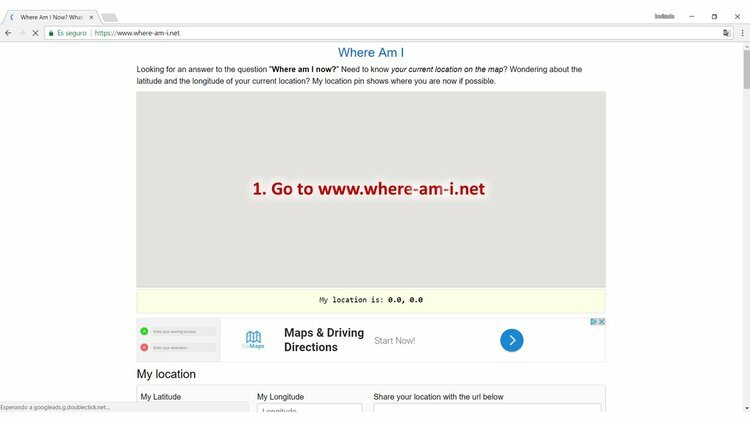 Please note: If this method shows you an incorrect location on the map, then please try again with the other method below. A pop-up notification may appear somewhere on the screen asking if you are willing to share your location. On different internet browsers, this notification will appear in different areas of the screen *. 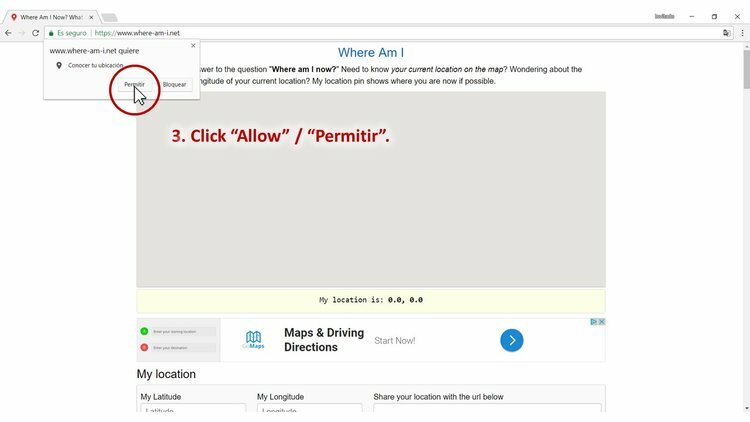 If no notification appears, and a map appears, then please see Step 4. Press "Allow" to allow your location to be found. A map will appear, with your location marked on it. Please check that it is correct - there are various reasons which it might not be correct, including the use of VPN networks **. 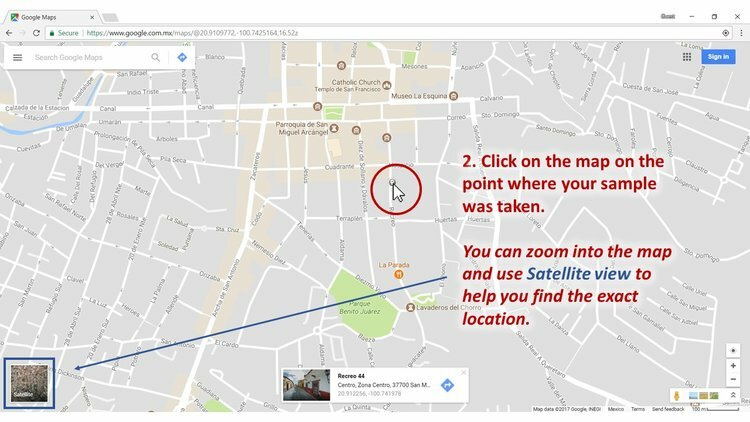 If your location is not shown correctly, please try our other method (below) to find your GPS coordinates. A yellow strip will appear below the map with text that reads something like: "My location is: 20.123456, -100.123456". Click and drag to highlight just the two numbers. Right-click on the highlighted coordinates, and click on "Copy" in the drop-down menu. You can then paste the coordinates wherever you'd like. * The location of this pop-up notification will depend on which internet browser you are using. For Chrome and Firefox, it appears at the top-left; for Internet Explorer and Microsoft Edge, it appears at the bottom-middle; and for Safari and Opera, it appears at the top-middle. ** VPN stands for Virtual Private Network, and is a system used by some internet users for extra privacy. 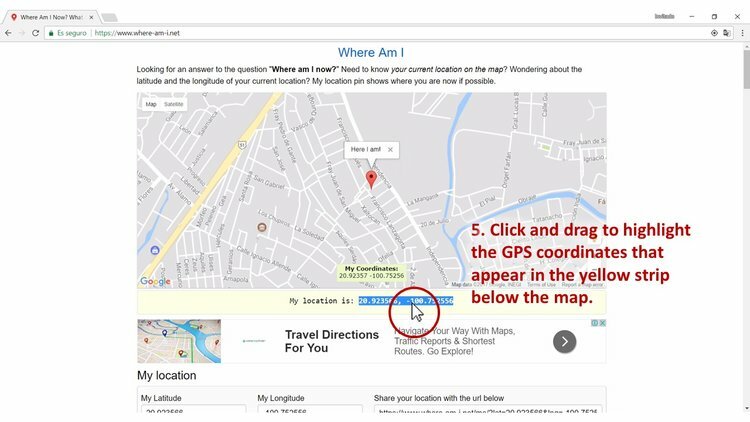 However, VPN systems can make your computer give an incorrect GPS position when using geo-location tools such as the one used in this method. Visit Google Maps at www.google.com/maps. Scroll and zoom to the correct location, and click the map on the point you want to find the coordinates of. It may help if you use "Satellite" mode, by clicking the box in the bottom-left corner of the screen. 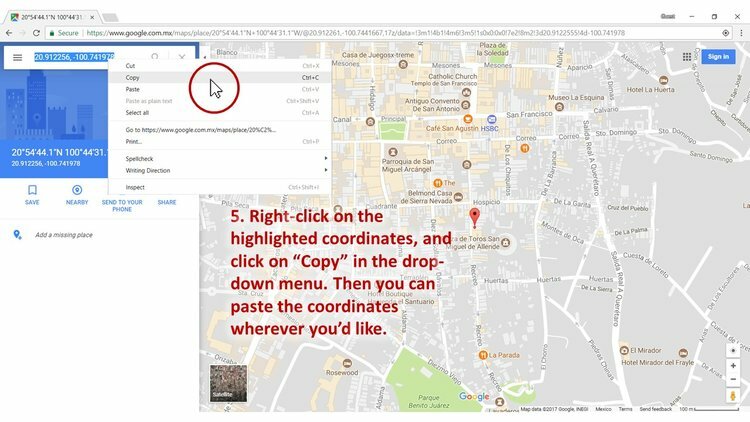 If clicking the map does nothing, then try right-clicking on the point you want to find the coordinates of, and in the drop-down menu that appears, click "What's here?". In the white box that appears below, click on the GPS coordinates. Click and drag to highlight the GPS coordinates that appear at the top of the panel on the left. Right-click on the highlighted coordinates, and click on "Copy" in the drop-down menu. Then you can paste the coordinates wherever you'd like.